WANT TO GET THIS HALF OFF? SIGN UP FOR OUR EMAIL LIST, AND WE'LL SEND YOU A 50% OFF DISCOUNT CODE! 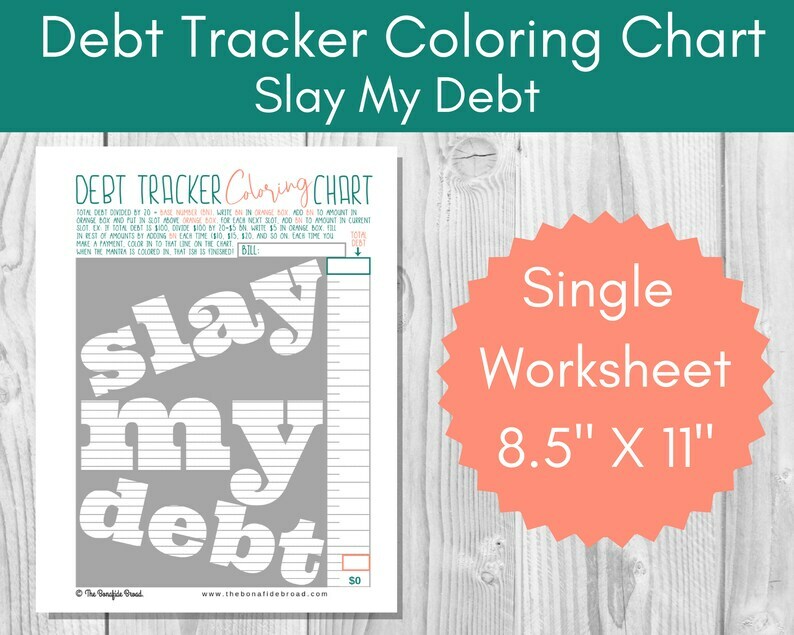 Item: Slay My Debt Debt Tracker Coloring Chart 8.5" X 11"
THIS IS NOT A PHYSICAL PRODUCT. NO ITEMS WILL BE MAILED TO YOU. THIS IS A DIGITAL DOWNLOAD. NO ITEMS WILL BE SHIPPED TO YOU. THIS IS A DIGITAL DOWNLOAD. This listing is for an INSTANT DOWNLOAD. You are purchasing digital files. Items are not available for download until AFTER purchase. This file is comprised of an 8 1/2" X 11" sheet that you print out yourself. You can print this out on your own computer, or you can take it to a print or photoshop (FedEx, Office Max, Staples, etc.). You can also have it printed online. and sent right to your mailbox. You or your print shop can also adjust the size to your needs. RECOMMENDED PAPER: We recommend printing on regular 8 1/2" X 11" paper. Colors may vary slightly on different screens or printers. No physical product will be delivered. NO PRINTED MATERIALS OR FRAME ARE INCLUDED! The digital file will be instantly available to download after your payment is received. Because this is a digital product that you download after purchase, we DO NOT offer refunds or exchanges. All designs are the property of The Bonafide Broad, and are for personal use only. Designs are not to be used for commercial purposes.